Reference number for this case: 3-oct-54-Ronsenac. Thank you for including this reference number in any correspondence with me regarding this case. "I saw on the edge of the road a kind of large barrel which was swinging..."
For a certain time already, the sky, and by repercussion the columns of the newspapers, are filled with flying saucers, cigars and mysterious machines. We will acknowledge here that in spite of the accounts that we echo, we remain rather skeptical. This enables us to more freely report the following fact which occurred this time in the Charente and which was brought back to us by a healthy and well balanced person whose good faith can by no means be doubted. "I was driving quietly at less than thirty kilometers per hour, I had just exceeded by 100 meters approximately the monument raised to the memory of the F.F.I [French Forces of the Interior, resistance during the occupation of 1939-1945] when all of a sudden, I saw in the light of my headlight like a kind of barrel of one meter in diameter approximately, high perhaps of one meter eighty. Kinds of yellow nails shone in the light. The unit constituted a brown mass. I acknowledge that I was very afraid. I passed without stopping at to 1 m 50 of the machine which was swinging as if it had been assembled on pivot. In a word, it did not look stable. "A ten meters of it, I turned myself, and I did not see anything anymore." 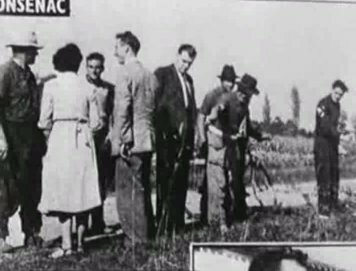 Accompanied by Mr. Hubert, tobacconist in Juillaguet, his son and Mr. Jean Allary, we went to the very location where the young farmer claims to have seen what we will call "the mysterious barrel" and there, we saw in grass on the low side of the road, three very clear points of impact. On the basis of one of these points of impact, a long trail of approximately seven meters was widening. Of ten centimeters approximately in its beginning the trail had twenty-five centimeters at its end. The grass was strongly crushed, curved even apparently and the fact that the pressed part began only at one meter from the road, makes us discard the assumption of a trail caused by the tire of a car. We will of course take care not to draw any conclusion at all, but we cannot prevent us from only saying that the observations which we made corroborate in a strange way an account of which we do not have any valid reason to question the perfect authenticity. LYON. 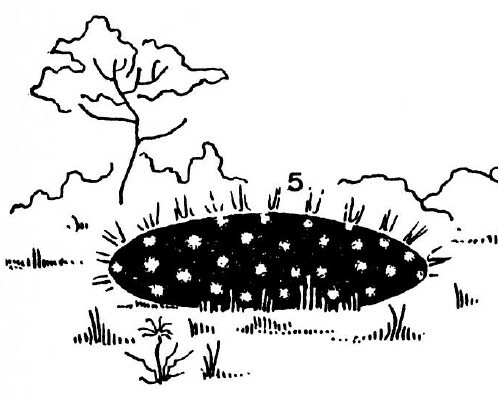 -- Several people stated to have seen in the area of Epinac-les-Mines (the Saone-and-Loire), a kind of large luminous ball evolving slowly in an odd way in the sky. Puzzled motorists stopped on the road and could observe this ball during several minutes before seeing it disappearing suddenly for Le Creusot. A similar phenomenon was observed in Ain and the north of the department of the Rhone, towards the collar of Echarmeaux, as well as in the Isère, close to Morestel. LE HAVRE. -- Mr. André Lefebvre, taxi driver, who stationed around 8 p.m., on the harbour, saw an incandescent disc which, at the West of Deauville, went up in the sky, leaving behind itself a phosphorescent trail and a light smoke. This phenomenon, which was visible during ten minutes, had also as witnesses several sailors regaining their boat. LE PUY. -- Mr. and Mrs. Teyssier, of St-Etienne, who camped in Aurec-on-Loire (the Haute-Loire) saw in the sky a luminous object giving the impression of a large headlight which moved at a fast pace at approximately 2.000 meters of altitude. The machine emitted a ray of light of orange red color, and followed a North-South trajectory. When it had disappeared, a second machine similar to the first and appearing to follow it appeared, followed the same direction and disappeared too. Approximately at the same moment several people saw, above the bell-tower of Aurec, similar craft, which after having become motionless one moment crossed the sky at a fast pace in direction of the South-west. LENS. -- Sunday evening, around 09:30 p.m., in Ablain-St-Nazaire, a craft which had the shape of a pot and which rotated was seen in the sky by two people. It released a reddish gleam and quickly moved. At the same hour, a craft which, this time, had the shape of a crescent was seen in the sky in Liévain. After having hovered during a few minutes, the crescent split in two. The higher part then remained motionless, while the other landed in a field, between two haystacks, from where it flew away little afterwards to go to reattach to the part that had remained in the air. ANGOULEME. -- Sunday evening, at approximately 11:15 p.m. on the Montecreau-Ville-Bois-Lavalette road (Charente), Mr. Jean Allary, aged 22, saw very clearly, in the gleam of the headlight of his motorcycle, a kind of barrel high of approximately 1 m. 80, spread of gilded nails, which was oscillating on the edge of the road. When Mr. Allary had passed the mysterious machine, he turned back at a distance of approximately ten meters, but he did not see anything anymore. Witnesses saw, at the very spot indicated by Mr. Allary, traces of approximately seven meters length in the grass which borders the road. In addition, the same night, Mrs. Bellanger, resident of Cognac, saw at an altitude of approximately 300 meters, a machine in the shape of cigar, of orange color, moving slowly above the city. CLERMONT-FERRAND. -- Residents of Clermont saw, around 7 p.m., in the sky, a luminous point of the dimension of a large star, which frequently changed color, passing from the white to the green while tainting itself of orange. The luminous point appeared animated of a rotary movement. While disappearing it left behind itself an orange plume. Lille, 5 October. - A retired mine worker of Beuvry-les-Bethune, known in his commune as a prankster, did not miss the opportunity offered to him by the mystery of the flying saucers to amuse himself at the expense of the inhabitants of the neighboring localities. Inspired by the hot air balloon system, the happy retired man built machines that were three meters in diameter. The envelope consisted of sheets of gray paper, strongly glued together. At the base of the "saucer" was a small receptacle in which lay a tuft of tow impregnated with a flammable liquid. It was then enough to ignite the tow to see the machine rise and disappear at the winds, surrounded by yellowish and orange reflections. It was after the discovery of one of these devices near a stack of straw, to which it had almost set fire, that the gendarmes were led to suspect the retired man. In fact, there were many models of "flying saucers" at his place, prototypes that their inventor was preparing to launch in the sky of the Nord. The mystifier claimed that he had already built and launched more than a thousand of these devices. The ex-mine worker will no doubt be sentenced to fines for dangerous amusement. Le Havre. -- Mr. André Lefèvre, a taxi driver, who was parked yesterday evening at 8 p.m. on the harbor, saw an incandescent disk which rose to the west of Deauville, leaving behind a phosphorescent trail and a slight smoke. This phenomenon, which was visible for ten minutes, was also witnessed by several sailors returning to their boat. The Puy. -- Mr. and Mrs. Teyssier, of Saint-Etienne, who camped at Aurec-sur-Loire (Haute-Loire), saw in the sky a luminous object giving the impression of a large headlight moving at a rapid pace at about 2000 meters altitude. The craft emitted an orange-reddish light beam and followed a north-south trajectory. When it had disappeared, a second apparatus, similar to the first, appeared to follow it, in the same direction, and disappeared in its turn. At about the same time, several persons saw above the bell-tower of Aurec similar machines which, after being immobilized for a moment, crossed the sky at a rapid pace towards the south-west. Lens. -- Sunday evening, around 9:30 p.m., in Ablain-Saint-Nazaire, a machine that had the shape of a pot and which rotated on itself was seen in the sky by two people. It emitted a reddish glow and moved quickly. At the same time, a craft which, this time, had the shape of a crescent, was seen in the sky of Liévin. After hovering for a few minutes, the crescent split in two. The upper part then remained motionless, while the other landed in a field between two haystacks, from which it took off shortly afterwards to join the part that was in the air. Angoulême. -- Sunday evening, around 9:15 p.m., on the road from Montmoreau to Villebois-Lavallette (the Charente), Mr. Jean Allary, 22, saw very clearly, in the light of his moped's headlight, a sort of barrel high of about 1.50 meters, studded with gilded nails, which swayed on the side of the road. When Mr. Allary had passed the mysterious machine, he looked back, at a distance of about ten yards, but he saw nothing. Witnesses saw, yesterday afternoon, at the very place indicated by Mr. Allary, traces about seven meters long in the grass that borders the road. Autun. -- Several people said they saw in the region of Epinac-les-Mines (the Saône-et-Loire), a kind of large luminous ball moving slowly in a bizarre manner in the sky. A similar phenomenon has been observed in the Ain and in the north of the Rhone department, towards the Col des Echarmaux, as well as in the Isère, near Morestel. Nevers. -- In Chateau-Chinon, five persons whose sincerity could not be doubted, saw a phenomenon which occurred several times before their more astonished than frightened eyes. At 9 o'clock a luminous spot of oval shape, seemingly motionless at a very high altitude, appeared in the sky. At one point the spot began to rotate at full speed, changing color several times. Then all went out, but after a few minutes the luminous spot reappeared, split again, and began to rotate. After the flight of saucers over the White House the investigation revealed that radar sets were mistaken. Thousands of people have actually seen the "bright objects" wander in the sky in a puzzling manner. Certainly, on September 28, the "saucer" seen above Mt. Revard by Dr Martinet and fifteen other people was a flock of starlings. The good doctor admitted his mistake the next day when an aviator, Michel Guyard, came to reveal that he also was intrigued by this glittering whirl, but that as he approached it with his plane he merely frightened peaceful birds - as a result, the perfect disc they formed was disrupted. It is impossible, however, to explain other reports of observed phenomena as collective hallucination... although it is fair to note at first that these "saucers" appeared with extremely diverse aspects. In the few hundred and fifty cases we have been cataloged in France, they looked round or oblong balls of fire, matt or bright, big or small, blue, green, red, yellow or white, naked or surrounded of a ring, noisy or silent, producing sparks (or smoke) or leaving no wake, when they did not have the form of discs, cigars or half cigars. They were seen day and night, although their occupants preferred the troubled hours of dusk. They were especially seen evolving in every manners: slowly or quickly, horizontally or vertically, in a straight line or in a broken line. How to sort all this? Could there be so many different saucers with so many different origins? If they come to us from outer space, are there so many other inhabited worlds... and who are interested in us? In truth, nothing precise could be learned of the reported sightings and often witness of the same phenomenon does not agree among themselves as to the size, shape and color of the object. So we are at the same step as the Americans in 1952, when the new radar set installed just a few days ago in Washington detected flying "saucers", finally placing the matter in the field of science. This device could not be wrong and played the role of arbitrator in an unexpected but worrying manner. Specialists on duty assured the survey in their new premises, when one fine morning the watchman was startled: a luminous echo appeared on the screen although no aircraft was reported. They first thought - it had happened - that a commercial aircraft had violated regulations of air navigation and was flying over the forbidden zone of the White House. They alerted "Shooting Star" squadrons, which took off immediately. But the "object" fainted before the arrival of the jet fighters. Thus the thing had fled at such an unimaginable speed, showing by that the existence of these objects zigzaging at thousands of kilometers an hour before dissolving in the sky. The emotion climbed and it was officially decided to strengthen monitoring devices. The order was not useless, because a few days later, a new alert was given. Jet fighters take off and rush at the full power of their reactors to the spot of the sky indicated by their radio, but arrived there, they announced again: - The sky is empty. "For God's sake, do not shoot on the saucers!" This time radar men jump on their feet. The bright spot is on their screen, indisputable and provocative. The small spots of the "Shooting Star[s]" come close to covering it. Saucers, cigars and fireballs. - Attention, you are in contact, scream the radar experts. But the fighters rush at 800 km/h in a still desert sky, with perhaps at this place a slightly milky transparency. Are the famous "objects" merely ectoplasm? Once again public opinion is moved. Letters reach the U.S. Air Force to ask "not to irritate the visitors." "For God's sake, do not shoot at the saucers" implores a correspondent. Technicians, of course, do not believe in ghosts. A new commission is appointed. For six months, aerodynamic engineers, astronomers, meteorologists and scientists of all disciplines having some possible connection with the "saucers" study dozens of cases. And their conclusion sudden bursts, amazing but indisputable, freeing America of a part of its fear, by revealing the radar, too, was wrong. Each time a ghost image scored the fighters, meteorologists found in altitude, the presence of a layer of cold air between two layers of warm air. The density (and index of refraction) of air varying with the temperature, this "sandwich" had acted like a mirror to the radioelectrical airwaves and airplanes were guided, after a descent as fast as the rise, towards sheds or metal structures on the ground. The phenomenon can also reflect the sun in the day and the moon and the lights of a city at night. Often, the picture is double or triple, each separation surface playing a distinct role; "Saucers in pairs." Certainly temperature inversions do not explain everything. But US experts feel that they were responsible for nearly 80% of the reported luminous apparitions beyond the Atlantic, and many mysterious machines seen in France can probably be allotted to them. It may be noted, in chronological order, two parallel gleams in Antibes, in August 1949, two silver balls in Poitiers, May 10, 1952, two white discs at Roche-sur-Yon, twelve days later, "numerous red saucers" flying in zigzag, two by two, on October 17, 1952 in Oloron-Sainte-Marie (the radar of Mont-de-Marsan perceives its echo like its American brothers). Many other cases could be cited to the most recent: last September 24 three oval objects were reported in Bayonne, three in Charente-Maritime and six "cigar" evolving two by two in Lantefontaine, Lorraine. Cases of isolated phenomena are even more numerous. - What! cry the disappointed "pro-saucerists", so, it was only this? Honestly see that we find in this category of events most characteristics reported by the "witnesses": blurry lights, sometimes surrounded by a halo, appearance and disappearance (with the complicity of clouds or because of the fading of lighting conditions) and above developments as capricious as fast. The surface of separation of two air layers are not still, of course; it empties and oscillates under the influence of currents in the atmosphere and the image is rejected from one corner of the sky to another. It is regrettable that comments are usually too vague to allow the technician to decide with authority; but only immaterial manifestations may be gifted the dizzying, instantaneous speeds, lent to "saucers" in which most cases. Whatever their origin, terrestrial or extraterrestrial visitors, they would be subject to the laws of the universal gravitation (and consequently the acceleration), that all the planets in all galaxies undergo. Whatever the power of their machinery and engineering, "Saucers" could not overcome their own weight. And all the magnetic currents or other cosmic rays they are deemed to use may make immaterial beings. But the meteorologists still have in their arsenal the noctilucent clouds that Vestine and Störmer think to be composed of very fine cosmis dust from outer space. These meteors are at 75 or 80 kilometers high, becoming brighter as the night goes on and present their maximum brightness at about midnight. The very serious "International Atlas of clouds "indicates that they may be driven by the powerful air currents prevailing in these altitudes, at speeds of 50 to 250 meters per second, or 180 to 900 kms. Let's recall in our turn that it only takes a small cumulus, although classic, but hidden in the night, so that the "saucer" vanishes and reappears. - But, protesting the "pro-saucerists" you still have demolished only simplistic and disappointing sightings with this argument. They can rest assured there are other answers, more varied and also safe, to the most amazing events. Barrels, discs, pots, headlights and flying balls are on the verge of dethroning the saucers and other cigars. The time is gone, by far, when an ordinary "saucer" crossed the blue sky at high pace and disappeared over the horizon leaving a bluish trail. Since then, there were "cigars" which, together with their shape, generally took shimmering colors allowing witnesses not be wrong. All this is outdated, if we judge by the recent observations made in France by people whose good faith may not be in doubt. The mysterious craft that arouse so much controversies and are poised to discord in many families between those who believe and those who disbelieve it, now take extremely varied and pleasing forms. As to colors, they turn from red to yellow through orange to any possible colors and halftones. Thus we have seen over the last twenty-four hours in the sky of France, several discs, a large headlight, a big ball, a pot, a crescent, and a barrel, a big star, not to mention the "saucers" and other "cigars" whose enumeration would be too long. The disks attracted the attention both of a Le Havre taxi driver, over Deauville, and a Lyon journalist south of the Basilica of Fourvière. In both cases, they were red-orange colored and shiny. They disappeared after ten minutes. The big headlight was moving over Aurec-sur-Loire (Haute-Loire) at high speed by issuing a orange-red light beam also. "When it disappeared", witnesses, Mr. and Mrs. Teyssier, of Saint-Etienne, said, "a second craft, similar to the first and appearing to follow it disappeared in the same direction." In Epinac-les-Mines (Saône-et-Loire), drivers, puzzled, stopped at the roadside to follow the slow and graceful maneuvers of a big ball of light whose color, unfortunately, is not specified. It was night in Montecreau-Villebois-Lavalette (Charente) when Mr. Jean Allary, 22, saw by the light of the headlight of his motorcycle, a kind of 1.80-meters-high barrel and nails of golden nails! It swung on the roadside and fled when the witness approached. The next day, at the place indicated by Mr. Allary, witnesses spotted traces of about seven meters in length in the grass by the roadside. It is the Clermont-Ferrand residents who, today, had the last word with the big star changing from the white to green and yellow to red, which, driven by a rotary movement, left behind an orange plume Monday night at 7 p.m. in the sky of Clermont-Ferrand. These celestial phenomena result, we have said it, in heated controversy. Thus a Professor of the University of Bonn, Joseph Meurès, said during a conference: "The book by American author Key Hoc [sic, Keyhoe] on flying saucers is not even worth the paper on which it is printed." Mr. Duneau Fletcher, vice president of the Astronomical Association of Kenya has another opinion: "The existence of saucers" is not to question, he believes, very experienced observers have seen them across the globe. And Mr. Fletcher gives his little idea on the question: "Visitors from another world observe the Earth and probably map it." Aimé Michel reports that on October 3, 1954, towards 22:45, Jean Allary, 23 years, had left Montmoreau on his auto-cycle and rolled on the secondary road 16 of Charente towards Villebois-Lavalette. Before arriving at Ronsenac, it saw in the light of its headlight a circular object who moved gently on the edge of the road, by not spreading any light, but with small brilliant points "similar to gilded nails" who were however visible. The object had a height of 1 m 20 and seemed to slip on grass. The witness was impressed too much to stop and could not see, when he passed by, if it touched the ground or not. The witness looked back at it after passing by and saw it taking off quickly while becoming luminous. The witness told his story and on the next day, several people came with him on the premises. They noted there that the grass of the roadside was flattened and somewhat torn off over a seven meters length. October 3, 1954, 10:45 p.m.. Ronsenac (Charente). A circular craft was seen by Mr. Jean Allary, age 22, while riding a motorcycle between Montmoreau and Villebois Lavalette, France. It seemed to be gliding over the ground. It showed luminous spots and became completely illuminated when it took off. It was about 1.2 meters high. Grass was found flattened and scorched over an area seven meters across. Oct. 03, 1954, 10:45 P.M., Ronsenac (France). A circular craft was seen by Jean Allary between Montmoreau and Villebois-Lavalette. It seemed to be gliding on the ground. It showed luminous spots and became completely illuminated when it took off. It was about 1.20 m high. Grass was found flattened and scorched over an area 7 m across. (36; M 130) (Combat, la Croix, France-Soir, le Figaro, Paris-Presse, Oct. 6, 1954). The author indicates that on October 3, 1954, between Montmoreau and Villebois-Lavalette, close to the village of Ronsenac, a circular apparatus was seen, which seemed to slide on the ground. It showed some sources of light but was not completely illuminated. When it flew away, however, it became entirely luminous. The two authors indicate that on October 3, 1954 at 10:45 p.m., Jean Allary was driving on his motorcycle on the secondary road D16 between Montmoreau and Villebois-Lavalette, close to Ronsenac, in the Charente. He saw very clearly in the gleam of his headlight a barrel of one meter in diameter, high of approximately 1 meter 40, covered of gilded nails, which oscillated as if it were mounted on a pivot. It was posed on the edge of the road. When the witness had passed by the mysterious machine, he looked back from a short distance but there was nothing to see anymore. Seven meters traces could be noted little afterwards at the place indicated by the witness. The authors indicate that the sources are the Vallée catalogue and a press article. October 3, 1954, Montmoreau, France 10:50 p.m.: multiple witnesses, oval object, traces. The authors indicate that on October 3, 1954, at 10:45 p.m., close to Ronsenac in the Charente, a 22 years old single witness who circulated on a motorcycle had distinguished with the gleam from his headlight a "barrel with gilded nails" of approximately 1.40 meters in height which seemed posed at the edge of the road. Surprised, he looked back as soon as he had exceeded it to observe it again, but all had disappeared. The authors indicate that the sources are the Vallée Catalogue, case 186, and numerous newspapers of the times. Ground traces highlight the next case that took place at Ronsenac where the witness was 23-year-old Jean Allary. He spotted a big circular object some 3-4 feet thick gliding on the ground. As the object glided along, a number of luminous spots were visible on its surface, but when the thing rose and flew away the entire object became luminous. An area of grass about 6 yards wide was found flattened and scorched. 34. 34. France-Soir. 6 October 54. They indicate that the sketch is by Jean Giraud. Similar to the Premanon account, but some days later, a woman and her son heard strange noises outside their house on the night of October 2nd. They witnessed a red light in the garden, hovering above their vegetable patch, in which spinach were growing. They reported that the light soared away into the sky. On the morning of October 3rd, they discovered that in the spinach patch was a circle, consisting of 3m of flattened plants. A window in the building had also been broken in the process. This cas has been reported extensively by Terence Meaden (eg in Circles Effects and its Mysteries, page 52), who interpreted it as evidence for his plasma vortex hypothesis. The author indicates that in the evening of October 3, 1954 in Ronsenac in the Charente, Jean Allary, aged 22 at the time, drives a motorcycle on the D16 road between Montmoreau and Villebois-Lavalette. In the light of its headlight, it sees a "barrel covered of gilded nails" posed at the edge of the road. After he passed by, he looked back and there was nothing any more. Traces of 7 meters were found on the spot. Jean Sider indicates that the source is Figuet page 114, and adds that according to "Radar" #298, page 3, who sent a reporter on the spot to question the witnesses, Mr. Allary would have recorded swarming, tremors, palpitations and sweats in his sleep following the observation. Jean Sider suggests that as the craft had disappeared, the witness was perhaps abducted. Godelieve van Overmeire indicates that in 1954, on October 3 in Ronsenac in France, a circular craft was seen at 22:45 by Jean Allary between Montmoreau and Villebois-Lavalette. It seemed to slip on the ground. Brilliant dots were seen there and it was completely illuminated when it took off. It was approximately 1,20 m high. At this place crushed and burned grass was found on a 7 m length. Godelieve van Overmeire gives as sources Combat, La Croix, France-Soir, le Figaro, Paris-Presse, Oct. 6, 1954; and Jacques Vallée: "Chronique des apparitions ET" - Denoël 1972 - J'Ai Lu Coll. - p. 266. Report 10/3/54 Montmoreau, France 2250: multiple witness, oval object, traces. On the same day as the St. Soupplets case, a 7m swirled circle was found in grass. The plants were scorched besides being flattened. Donald Johnson indicates that on October 3, 1954, at 10:45 p.m. a circular craft was seen by Mr. Jean Allary, age 22, while riding a motorcycle between Montmoreau and Villebois Lavalette, France. It seemed to be gliding over the ground. It showed luminous spots and became completely illuminated when it took off. It was about 1.2 meters high. Grass was found flattened and scorched over an area seven meters across. Donald Johnson indicates that the sources are "Aime Michel, Flying Saucers and the Straight Line Mystery, p. 130; Jacques Vallee, Passport to Magonia: A Century of Landings, p. 216; Michel Figeut and Jean-Louis Ruchon, OVNI: Le premier dossier complet des rencontres rapprochees en France, p. 114." Andreas Müller indicates that in Ronsenac, France, there was "A single circle approx 25' dia. with evidence of burning." The "Date created" and "Date reported" are noted 3rd Oct 1954, the "Crop type" is noted as "grass". No source is given. Anne Moro indicates in English that in "Rosenac" [sic] in France, on October 3, 1954, "a single circle of flattened and partially burned grass was fund [sic]", "Data II" and "Circle: 7 m diameter". Anne Moro indicates that the source is the database by Andréas Müller "ICCA-The international Crop Circle Archive". DEP: CHARENTE Ronsenac A circle of 7 m in diameter. This is said to be a translation of "the data of Andréas Müller compared to the magazine 'The Circular' #41 - Spring 2001." Jerome Beau indicates that on Sunday October 3, 1954, at 22:45 in Ronsenac (France), "1 circular machine is seen by Jean Allary, between Montmoreau and Villebois-Lavalette. It seems to slip on the ground, brilliant dots are seen there and it illuminates completely when he takes off. It is approximately 1,20 m high. At this place crushed and burnt grass is found on a 7 m length." Jérôme Beau indicates that the sources are Combat, La Croix, France-Soir, le Figaro, Paris-Presse, October 6, 1954. Luc Chastan indicates that in the Charente in Ronsenac on October 3, 1954 at 22:45, the witness drives by motor-cycle on the D16 between Montmoreau and Villebois-Lavalette, close to Ronsenac; he very clearly sees in the gleam of his motor-cycle headlight a barrel, one meter in diameter, approximately 1 m 40 high, covered of gilded nails, which oscillated as if it were mounted on a pivot which is posed on the edge of the road. When the witness had passed by the mysterious craft, he looked back at a short distance but does not see anything any more. Traces of seven meters were noted little afterwards at the place indicated by the witness. Luc Chastan indicates that the source is "Ovni, Premier dossier complet... by Figuet M./ Ruchon J.L. ** Alain Lefeuvre pub. 1979". October 3: [...] Shortly after noon, a man saw a circular craft between the towns of Montmoreau and Villebois-Lavalette. It seemed to be gliding on or near the ground, had luminous spots, and became illuminated when it took off. The man found flattened and scorched grass over an area 25-feet across. The website indicates that on 3 October 1954 at 12:45 in Ronsenac, France, a circular craft, "1.20 meters high, glided across the ground. Explanation: Planet." The website adds: "A circular craft was seen by Jean Allary between Montmoreau and Villebois-Lavalette. It seemed to be gliding on the ground. It showed luminous spots and became completely illuminated when it took off. It was about 1.20 meters high. Grass was found flattened and scorched over an area seven meters across." And: "An object was sighted that had an appearance and performance beyond the capability of known earthly aircraft. One luminous ball, about 5 feet across, was observed by two male witnesses, typical age 23, on a farm for over one minute." The sources are indicated as Michel, Aime, Flying Saucers and the Straight-Line Mystery, S. G. Phillips, New York, 1958; Bowen, Charles, The Humanoids: FSR Special Edition No. 1, FSR, London, 1966; Lore, Jr., Gordon I. R., Strange Effects from UFOs, NICAP, Washington, 1969; Vallee, Jacques, Computerized Catalog (N = 3073); Vallee, Jacques, Challenge to Science: The UFO Enigma, Henry Regnery, Chicago, 1966; Vallee, Jacques, Preliminary Catalog (N = 500), (in JVallee01); Vallee, Jacques, A Century of Landings (N = 923), (in JVallee04), Chicago, 1969; Schoenherr, Luis, Computerized Catalog (N = 3173); Hall, Richard H. The UFO Evidence, NICAP, Washington, 1964; Phillips, Ted R., Ted Phillips investigation files; Phillips, Ted R., Physical Traces Associated with UFO Sightings, CUFOS, Chicago, 1975; Newspaper Clippings; Hatch, Larry, *U* computer database, Author, Redwood City, 2002. Donald Johnson says that on October 3, 1954, at 10:45 p.m. a small circular craft was seen rising from the roadside by Mr. Jean Allary, age 22, while riding a motorcycle between Montmoreau and Villebois Lavalette, Charente, France. It seemed to be gliding over the ground. It showed luminous spots and became completely illuminated when it took off. It stood about 1.2 meters high. Grass was found flattened and scorched over an area seven meters across. The sources are listed as "Michel, Aime, Flying Saucers and the Straight Line Mystery, p. 130; Jacques Vallee, Passport to Magonia: A Century of Landings, p. 216; Michel Figuet & Jean-Louis Ruchon, OVNI: Le Premier Dossier Complet des Rencontres Rapprochees en France, p. 114)." October 03, 1954, at 10:45 p.m., in Ronsenac, in the Charente, a circular machine was seen by Jean Allary, between Montmoreau and Villebois-Lavalette. It seemed to slip on the ground, and was illuminated completely when it took off. It measured approximately 1,20m top. At this place, one found crushed grass that turned light-brown over a 7 meters length. *Oct. 3, 1954 - At 10:45 p.m. a circular craft was seen by Mr. Jean Allary, age 22, while riding a motorcycle between Montmoreau and Villebois Lavalette, France. It seemed to be gliding over the ground. It showed luminous spots and became completely illuminated when it took off. It was about 1.2 meters high. Grass was found flattened and scorched over an area seven meters across. (Sources: Aime Michel, Flying Saucers and the Straight Line Mystery, p. 130; Jacques Vallee, Passport to Magonia: A Century of Landings, p. 216, case # 186; Michel Figuet & Jean-Louis Ruchon, OVNI: Le premier dossier complet des rencontres rapprochees en France, p. 114). Dominique Caudron indicates that the catalogue of 800 cases published in 1970 by Maurice Santos, is a good example of what one should not do; he indicates to extract from it the list of the cases of October 3, 1954; which he knows well as he had investigated into these cases of his area of Nord. For each case, below the text of the Santos catalogue, he states what should have been written, and the explanation after analysis, when there is one. Santos wrote that for this case #551 of landing, there had been on October 3, 1954, in Montmoreau, an Unknown Flying Object on the ground. Dominique Caudron says that at 11:15 p.m., at the location called Le Maine La Fontaine, 16190 Aignes-and-Puypéroux, a motorcycle rider saw in the gleam of his headlight a kind of brown barrel covered of brilliant nails which oscillated within 1.5 meters of the road. Looking back 10 meters further, he did not see anything any more. He notes that it is the only really odd observation of the Santos catalogue for October 3, 1954 in France, but that unfortunately the witness saw the object only a few seconds. He notes that the numbering of the cases by Santos seemed a good idea, but that it prevents the evolution of the catalogue, whose numbering becomes incoherent at the first update: "For example, this catalogue contains only 10 cases for the area of the Nord, whereas we know 48 of them. How to place the 38 others?" Picture published in "France-Dimanche" in 1954. Not looked for yet. A possibility is that he had seen fireflies, or reflecting berries, on some bush. [cl1] Article in the regional newspaper La Charente Libre, France, October 5, 1954. [lm1] Article in the regional newspaper Le Méridional, France, October 6, 1954. [er2] Article in the regional newspaper L'Est Républicain, France, page 1, October 6, 1954. [---] Article in the national newspaper Combat, France, October 6, 1954. [---] Article in the national newspaper La Croix, France, October 6, 1954. [---] Article in the national newspaper France-Soir, France, October 6, 1954. [---] Article in the national newspaper Le Figaro, France, October 6, 1954. [---] Article in the national newspaper Paris-Presse, October 6, 1954. [---] Article in Radar magazine, Paris, France, #298, page 3. [am1] "Mystérieux Objets Célestes", book by Aimé Michel, Arthaud publisher, France, 1958. [am1] "Flying Saucers and the Straight Line Mystery", book by Aimé Michel, English version of "Mystérieux Objets Célestes", S.G. Phillips publisher, USA, page 130, 1958. [jv5] "Catalogue préliminaire de 500 observations", listing in "Les Phénomènes Insolites de l'Espace", book by Jacques and Jannine Vallée, Table Ronde publisher, France, 1966. [jv1] "Un Siècle d'Atterrissages", article by Jacques Vallée, in the ufology magazine Lumières Dans la Nuit (LDLN), France, N.43. [---] "The UFO Evidence", book by Richard Hall for NICAP, USA, 1964. [am1] "A Propos des Soucoupes Volantes", book by Aimé Michel, reprint of "Mystérieux Objets Célestes", Planète publishers, France, 1969. [---] "Strange Effects from UFOs", by Gordon Lore Jr, NICAP, USA, 1969. [jv1] "Passport to Magonia - On Ufos, Folklore, and Parallel Worlds", book by Jacques Vallée, Contemporary Books publishers, USA, page 216, 1969. [jv1] "Chronique des Apparitions Extra-Terrestres", French translation of "Passport to Magonia", book by Jacques Vallée, Denoel publisher, France, page 265, 1972. [jv2] Summary by Jacques Vallée in "The Humanoids: A Survey of World-Wide Reports of Landings of Unconventional Aerial Objects and their Alleged Occupants", book by Charles Bowen, Neville Spearman publishers, U-K., 1969. [jv2] Summary by Jacques Vallée in "En Quête des Humanoïdes", book by Charles Bowen, French translation of "The Humanoids", J'ai Lu publisher, France, page 42, 1974. [am1] "Mystérieux Objets Célestes", book by Aimé Michel, Seghers publisher, France, pp 179-180, 1976. [jv7] "1954: 7 jours, 40 observations", article by Jacques Vallée, in "Les Soucoupes Volantes", History magazine Historia, France, Special Issue #46, page 44, 1976. [jv5] "Catalogue préliminaire de 500 observations", listing in "Les Phénomènes Insolites de l'Espace", book by Jacques and Jannine Vallée, Robert Laffont publisher, France, page 250, 1978. [fr1] "OVNI, Premier Dossier Complet des Rencontres Rapprochées en France", book by Michel Figuet and Jean Louis Ruchon, Alain Lefeuvre publisher, France, page 114, 1979. [tp1] "Top Physical Trace Cases - Cases of High Strangeness - A Preliminary List", by Ted R. Phillips, Center for Physical Traces Research (CPTR), USA. [cc1] "Ephémérides des Années d'Espoir de l'Ufologie", article by Gilbert Cornu and Henri Chaloupek, in the ufology magazine Lumières Dans la Nuit (LDLN), #255-256, page 26, September/October 1985. [---] "Circles Effects and its Mysteries", book by Terence Meaden, Sourcebook Project publishers, U-K., page 52, 1989. [ci1] Article in the crop circles magazine The Circular, U-K., #41, page 13, Spring 2001. [lg1] "The Fifth Horseman of the Apocalypse - UFOs: A History - 1954 October", monography by Loren E. Gross, USA, page 6, 1991. [qs1] "Les OVNIS", book by Michel Dorier and Jean-Pierre Troadec, Presse Universitaire de France pubilshers, "Que sais-je?" collection, 2nd revision, France, page 12, 1992. [js1] "Le Dossier 1954 Et l'Imposture Rationaliste", book by Jean Sider, Ramuel publisher, France, page 243, 1997. [---] "Computerized Catalog", compiled by Luis Schoenherr. [tw1] "The French Connection", article by Terry Wilson in the Crop circles magazine The Circular, #41, page 13, Spring 2001. [---] Catalogue by Maurice Santos. 0.1 Patrick Gross January 31, 2007 First published. 1.0 Patrick Gross January 9, 2009 Conversion from HTML to XHTML Strict. First formal version. Additions [js1], [go1], [lc1], [jb1], [ud1]. 1.1 Patrick Gross June 9, 2009 Addition [tp1]. 1.2 Patrick Gross January 11, 2010 Additions [ic1], [cc1]. 1.3 Patrick Gross February 28, 2010 Addition [dj2]. 1.4 Patrick Gross June 22, 2010 Addition [jv5]. 1.5 Patrick Gross July 7, 2010 Addition [ri1]. 1.6 Patrick Gross October 19, 2011 Additions [ci1], [oo3]. 1.6 Patrick Gross September 26, 2014 Additions [jv7], [qs1], [fa1], [ni1]. 1.7 Patrick Gross October 14, 2016 Addition [dc1]. 1.8 Patrick Gross December 16, 2016 Additions [lg1], [ub1]. 1.9 Patrick Gross December 30, 2016 Addition [pr1]. 2.0 Patrick Gross February 10, 2017 Addition [er2]. This page was last updated on February 10, 2017.